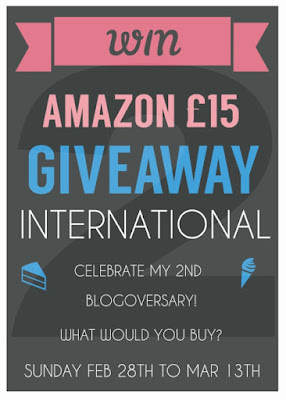 The 2nd Blogoversary Super Duper £15 Amazon Giftcard Giveaway!!!! So yep roughly two years ago I started this blog, I actually started off thinking I could be a food blog. I very quickly realised this was a bad idea. I blame Pinterest with its shiny food photos! 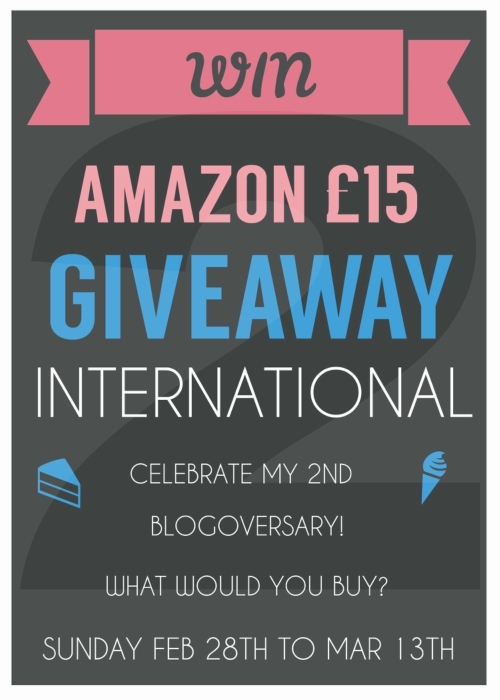 Anyway to mark the occasion of me actually managing to keep the blog going for this long I am having a giveaway!!! I'd probably buy Starflight by Melissa Landers. Our snow is gone hopefully now till the end of the year (fingers crossed!). Happy second blogloversary! That's fun you started off planning to be a food blog. 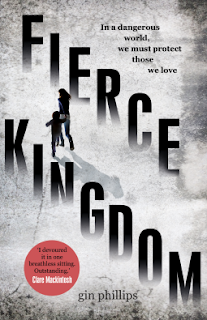 I started off as a book blog and eventually added a weekly food post. If I won the amazon gift card I would probably spend it on books. I would buy some books and a Harry Potter Trivial Pursuit board game. Ooh a food blog? I do like recipe and the like. I'm glad you decided to focus on books though. Congrats on two years! I'm glad too, I was hopeless at the photography! Congrats on hitting the two year blogging milestone! Congratulation Heather! 2 years of blogging is a looooong time. I would spend this on some craft supplies or a new book. :) Thanks! Craft supplies are good!! I love all that stuff! What would I spend a GC on? Books, definitely! But I don't know for sure which one or ones. There are some new books I have my eye on, and some favorite series for which I don't yet have all the titles. There are far too many good books to choose from!! Happy blogoversary! Two years is awesome. Your blog is 4x as old as mine :-P And I would totally spend an Amazon gift card on books since that's pretty much all I buy anymore with my spending money, haha. Thanks Kristen! You could pre-order the new Saga Volume 6?! !